We have implemented an enhancement to our Business Hours rules that will enable you to assign unique rules to specific employees or teams. They way it used to be was to assign Business Hours to the whole company, but now you can easily do it for individuals. 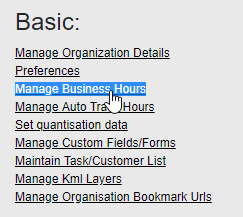 On the next screen you will be able to select the Business Hours, make sure to give this rule a name in the "Description" field. Leave blank any of the time fields that don't apply. By clicking on the blank section on the "Select User(s)" and "Select Team(s)" fields, you will enable a dropdown menu where you can select the users and teams that apply to this rule.